Taking possession of one’s new home is a moment of ultimate happiness and pride. Sometimes the excitement of the moment may cause you to miss out on some important checks that you must make prior to possession. 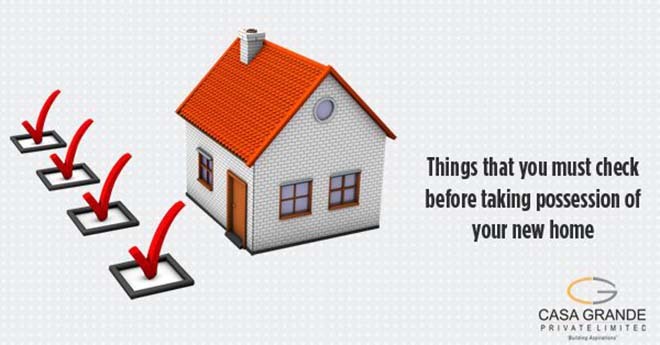 To help you make sure that taking possession of your new home is as smooth and hassle-free as possible, we have put down a ready checklist with all the points you should check before you take final possession of your new home. After studying the plan layout submitted by builder and architect, the licensing authority issues the approval for the same. This is the final certificate issued by the licensing authority and only after the issue of this Occupation Certificate, water connection is provided to the newly built home. It is also important to be able to sell or transfer your home to another person. Original registration documents, parental documents, drawings, concerned authority approvals and other similar documents are generally submitted to the association. It Is advisable to get a copy of these and a complete breakup of the common area as well. Air circulation is very important to lead a hale and hearty life in your dream home. For proper air circulation and sunlight, the doors and windows are to be placed properly especially in the kitchen and bathrooms and too much sunlight can have its negative effects as well. Sliding doors, if any, are to be checked and any defects should be brought to the builder’s notice. It is also important to check that your main door is fitted with a door eye/magic eye as this is one of the most basic features that a home must have. Some builders might leave your wall with a single coat of paint which may cause it to lose its shine within a very short period. It is better to check all the walls for a double coat. The balcony grills and gates are also to be checked for a proper finish. It would also be prudent to check for loose patches in the wall and look for fan hooks in the ceiling. Flooring and tiles would need to be checked for cracks and cleanliness. The slope of the tiles would need to be checked in the toilet, kitchen and balcony to ensure smooth water drainage. In the kitchen, the finishing/polishing of the counter and any leakage in the same should be checked as well. Placement of switches and proper electrical connection to all switches would need to be checked. If any non-functional plug points or switches are found, they should be brought to the builder’s notice. Another thing to check for would be AC ducting – bad ducting can cause seepage in the wall as well. Check the pressure of water from the taps to ensure it is at optimum level. Also, check the functioning of hot and cold water mixture knobs in the taps. Sanitary fittings are to be checked for cracks and ensure that the drainage system is in order. When there is an overload/short-circuit in your home’s electrical circuit, an MCB is the one that saves you from a possible overload/short-circuit. Hence it is of prime importance to check its functionality and that the MCB with the right range that is appropriate for your home has been fitted. A lot of amenities are usually promised at the pre-construction stages and it is vital to check whether all these are in place as mentioned. Also look for the specifications of the facilities offered and it is good to ensure that there is no deviation from what was stated earlier. The guidelines and safety measures specified by the Government are to be followed by the builder. The piped gas lines, if fitted, that enter your kitchen are to be monitored for proper functioning. Any promised security measures such as CCTV cameras or intercom must also be tested for functionality. Once all the above checks have been satisfactorily made, you should ensure that you have received the possession letter and the other documents that are to be received from the builder as per point number 1 above. We hope this checklist will help simplify the process and make your life easier as you take possession of your new home so you can focus on enjoying the moment and celebrating with your family and friends.